A perfect getaway! You will love entertaining with your friends and family in this home with its open floor plan, gourmet kitchen and abundance of light with its myriad of windows. Charming and quaint, with its two bedrooms, hardwood floors and woodstove for those chilly winter nights. French doors lead you out to a beautiful front deck with hand made benches for relaxing or, if you choose a bit more privacy hang out in the back on the 400 square foot glass enclosed back porch with its propane heater to enjoy even in the coldest winter nights! Basically another living room outside!! Don't forget to check out the basement with workshop and temperature controlled wine cellar. 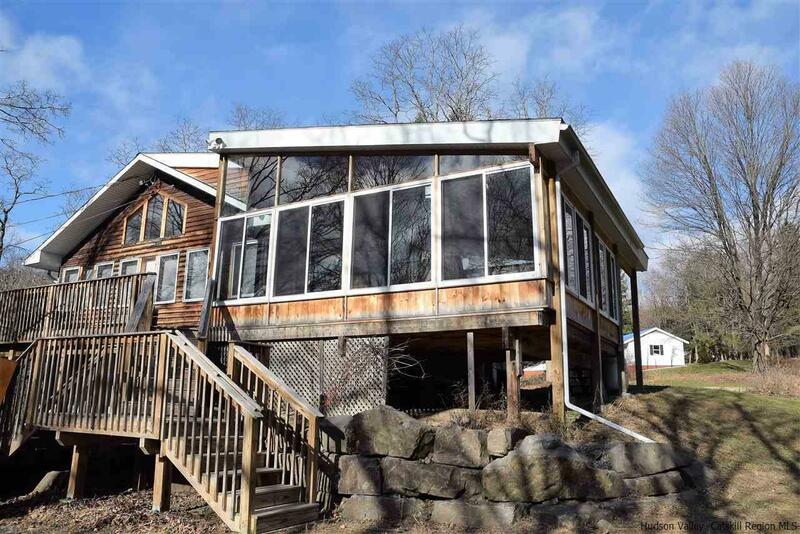 This home is situated on 2.2 acres just 5 minutes from the town of New Paltz and 10 minutes to High Falls. A quick bike ride or stroll down the road will take you to Mohonk Preserve for access to hundreds of acres of hiking trails. A wonderful property in an even better location. Are you looking for an Air B N B opportunity? This is the perfect location. Jump out of bed and you are in the Preserve,the Crown Jewel of Ulster County! 90 minutes to Manhattan. Come and make it yours.